Find Top Notch Staff for Your Dealership! Providing Staffing Since 1994 to New Car Dealerships! 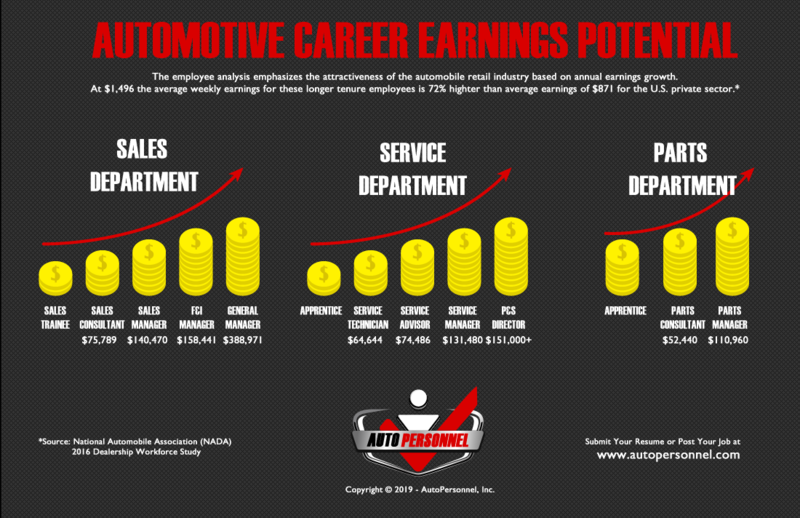 Auto Personnel is the premiere service for auto dealers and job seekers to meet, find the right fit and enjoy professional success. We recognize that there is a shortage of top notch employees available and therefore we want to contract with only a few top notch dealers in a given market area. The key to reducing employee turnover starts with hiring the Right person for the Right job! AutoPersonnel Matches the candidate with the job. COGNITIVE ABILITY. These tests are designed to measure a candidate’s ability to learn, adapt, solve problems and understand instructions. PERSONALITY TEST. These tests are designed to measure personality characteristics for a particular job description. Research has shown that selected individuals that match job description can increase employee productivity, job satisfaction, and improve customer service that is crucial to an organization’s performance. This tests accesses the alignment of a candidate’s personality with the demands of a job. MOTIVATION. Evaluates a candidate for key driver of motivation linked to workplace engagement and job performance. Looking For A New Candidate? Auto Personnel has a database of candidates from across the United States that have been vetted and pre-screened by seasoned industry professionals.Every candidate is pre-screened, interviewed and verified to ensure your success. Looking for a new job? Submit Your Resume Now! Finding a new job can be a stressful process, we make it simple. We maintain a constant updated list of job openings submitted by companies who are looking for the right person, and that could be you. Don’t settle by just adding your resume to an online job board. We personally review each resume and match you with the right jobs. All applications and inquiries are 100% confidential. Speak to a PRO! Need More Info or Answers? We’re Here to Help. At Auto Personnel our claim to fame is our extensive experience of staffing the auto industry since 1994. We know how important personal attention can be and that is what will always separate us from our competition.